The Bottom Line: Expect the warmest temperatures of the winter, so far. Warming, sun, and uncertainty of the snow layers at upper elevations will maintain heightened conditions. If you are heading to higher slopes, use caution on slopes 35 degrees and steeper. With warming and sun, uncertainty about the snowpack is increasing. Most loose wet avalanches you will see are a few days old. You may encounter soft, wet snow on sunny slopes and low elevations. About 13” of snow, followed by rain on Tuesday night and Wednesday led to a widespread natural avalanche cycle throughout the Cascades. Many large paths in the area ran including Wellington, Highway Chutes, Lichtenberg Southeast side, Arrowhead Northeast Bowl, The Swath, and likely others. It rained up to around 5,000ft, but at that elevation the crust is reported to be fairly thin. A high-amplitude late-January ridge centered over our region on Sunday continues to dominate the weather pattern through early next week. The ridge is bringing some of the warmest temperatures our higher elevation stations have seen in several months, while lower elevation stations have managed to warm up as well in spite of the overall inversion (a pattern where colder air sinks and pools in valleys). Overnight, the inversion should gain some strength as clear skies and light winds continue, with patchy very low-level fog developing once again. The fog should reduce in extent during the daytime. A shortwave weather system riding over the ridge Saturday night and moving down the Rockies into Montana on Sunday, resulting in the ridge axis moving slightly offshore where it will remain into early next week. This is likely to drop freezing levels by 2000 ft relative to Saturday. The upper-level flow should shift northerly while a colder high pressure from interior British Columbia drops southward along with it late Sunday, bringing cold air to the North Cascades and areas east of the Cascade Crest. It will also drive an offshore pressure gradient. Winds will pick up Sunday night and Monday. Now that we’re well into winter and in the midst of a prolonged period of quieter weather, this is a good time to assess the current snowpack. Most areas are hovering around 75% of average snowpack depth for the season to date. Many of this season’s storms have brought at least some rain to mid elevations at the passes and west of the Cascade Crest. Multiple periods of cool, clear weather formed persistent weak layers. Some of these are still present, depending on where you are in the mountains. Zooming in to current conditions, a storm on January 22-23rd impacted most forecast zones. This weather system changed snow at the surface of the snowpack, drove an avalanche cycle, and tested or changed the latest persistent weak layers. The storm ramped up late on the 22nd in most areas. Intense precipitation (mostly snow) fell by dark with strong wind and warming temperatures. In the early morning hours of the 23rd snow switched to rain at the passes and western zones. Cold air to the east maintained low-density snowfall at most locations well east of the crest. In some areas, especially east of the crest, a new weak layer may have been buried at the January 22nd interface. The bulk of the reported avalanche activity occurred on January 23rd with high precipitation rates and wind loading in the early morning hours or with liquid water in the snow from rain or warming and sun during the day. At the passes and in the western zones, reported avalanches were generally running either at the new/old snow interface or within the new snow. 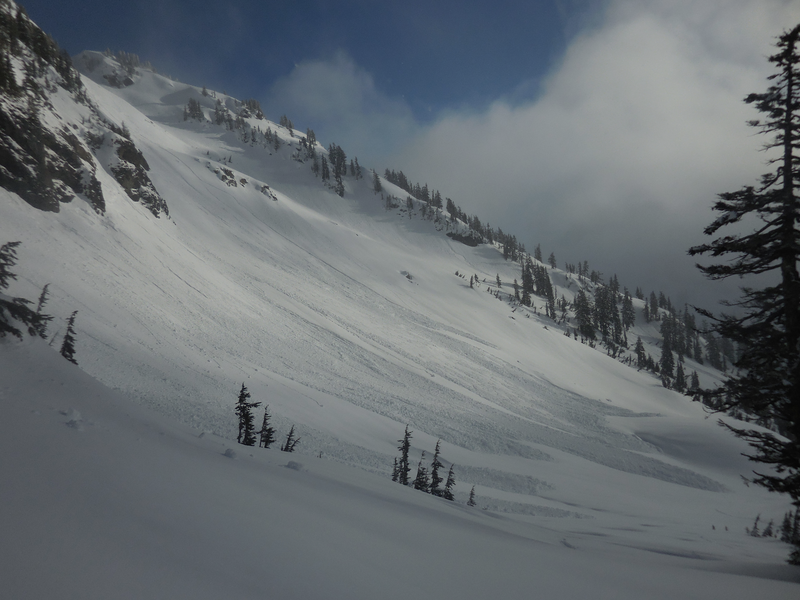 Observers reported a mix of soft slab, wet loose avalanches from near and below treeline with a few reports of shallow slabs above treeline. As of January 24th observations at upper elevations have been limited in most areas, due to lack of visibility and access. In the eastern zones at areas like Washington Pass, Icicle Canyon, and the Wenatchee Mountains, some reported slab avalanches were confirmed or suspected to have involved persistent weak layers, notably the January 17th surface hoar/near surface facets. Some widely propagating and/or large avalanches were reported, up to destructive size 3. Wind loading was a factor in many avalanches that released at upper elevations. Observers reported a widespread point releases on steep sunny slopes in the new snow where skies cleared on the 23rd. The latest round of snow, rain, and warming that tipped the balance of the snowpack was a good test of existing persistent weak layers. While the ever-changing snowpack keeps us busy tracking changes, some trends are already apparent. West Slopes and Passes: Where the January 17th interface, (surface hoar and facets) had been a concern below treeline, it seems that it generally wasn’t a player in avalanche activity. At low elevations, the PWL has either been wetted by liquid water or is now capped with crusts and moist snow. While we’re still digging to look for the weak layer, there’s good reason to prioritize other issues below treeline. Uncertainty still exists about the January 17th interface at upper elevations. Eastern Cascades: Persistent weak layers are still of concern. How much of a concern and exactly which PWL depends on where you are, north to south and east to west, in the range. Overall, January 17th surface hoar/near surface facets would be the main PWL to look for in the upper snowpack. Areas of shallower snowpack that lie further east of the Cascade Crest will have weaker snow and more pronounced weak layers in the mid to lower snowpack. In some places, the January 22nd surface hoar may become an issue with future storms. Persistent Slab avalanches can be dangerous. On the heels of the last storm, there's still a lot of uncertainty about if you can trigger these avalanches at upper elevations. The best approach is to pick conservative terrain, and avoid exposure to large avalanche paths until more information can be gathered.